The Van Dyke-Swaney-Rettig Funeral Home traces its history back to March 1, 1919 when Moore & Van Dyke began a partnership to provide funeral services to the residents of East Palestine and the surrounding area. This partnership lasted until July 1, 1923 when F. A. Van Dyke purchased all of the funeral home assets. Mr. Van Dyke operated the business, which was located in a building on the 100 block of West Martin Street, until his death in 1936. His wife, Martha Van Dyke then assumed ownership of the funeral service and moved the funeral home to the former Morgan Home at 60 West Martin Street in May of 1937. It was then known as the Van Dyke Memorial Home. Through the years, she was assisted at the funeral home by her two nephews, Glenn Swaney and Sam Huston, who were both licensed funeral directors. In the 1950's, the front porch was enclosed to provide additional space for the funeral home. 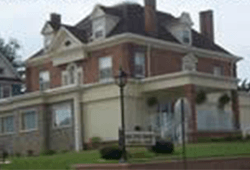 Mr. Swaney and his wife, K. Eudora Swaney assumed ownership in the late 1960's and in 1973 added an extensive addition to the funeral home building. This included a new large chapel, modern restrooms and preparation room, as well as a new casket selection room and extensive redecoration. Mr. Swaney died in 1979, at which time Mrs. Swaney, a licensed funeral director, assumed ownership and operation of the funeral home. In 1986, John F. Kummer and Jon W. Rettig, Sr. joined the funeral home as partners, and along with their wives, Wonda J. Kummer and Ellen C. Rettig, both licensed funeral directors, assisted Mrs. Swaney with the operation of the Van Dyke-Swaney Funeral Home. In 1998, Family Care Services was incorporated to provide funeral services through the Van Dyke-Swaney-Rettig Funeral Home as well as the Warrick-Kummer-Rettig Funeral Home in Columbiana and the Woods-Rettig Funeral Home in Leetonia. Today, the officers of the corporation are President, Mrs. K. Eudora Swaney; Vice Presidents, John F. Kummer and Jon W. Rettig, Sr.; Secretary, Wonda J. Kummer and Treasurer, Ellen C. Rettig. In 2001, renovations were began to improve the entrance to the Van Dyke-Swaney-Rettig Funeral Home as well as enlarging the chapel, provide handicap assessible restrooms as well as the addition of a children's lounge area and additional handicap ramp at the front entrance. Redecoration of all these areas are a part of this renovation which was finished during the Fall of 2002.